A team of researchers at Yale is expanding our understanding of how bacteria continue to evolve and adapt at the molecular level. By making a single change to a complex strand of RNA - the molecules essential for coding, decoding, regulation, and expression of genes – the scholars changed the way the strand folded up, completely switching the environmental signal it recognized. Writing in the journal eLife, the researchers used X-ray crystallography to describe the three-dimensional structure of a riboswitch that recognizes the molecule phosphoribosyl pyrophosphate, or “PRPP.” PRPP is an essential building block for all organisms and is negatively charged in multiple places. 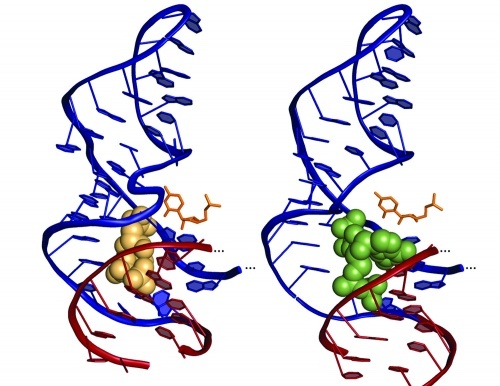 By mutating a single nucleotide in a region of the RNA called the “S-turn,” the authors produced a variant that binds to a different molecule (guanosine tetraphosphate or “ppGpp”), which acts as a distress signal to help bacteria respond to a variety of adverse conditions. In the variant produced by the scientists, the characteristic “S” shape of the mutated region is gone and ppGpp replaces the single mutated nucleotide, showing that RNA is capable of quickly evolving to take on a new role with a single change.